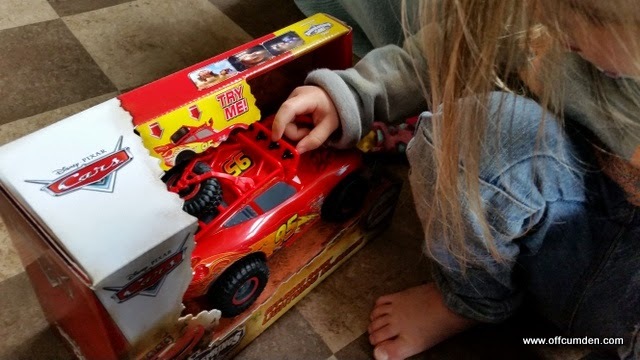 We were recently sent an off road Lightning McQueen car to review. My daughter (3) absolutely loves Lightning McQueen, so I thought she was the best child for the job. My son (5) has also played a lot with this. The car is a far larger version than others and makes it easier for children to take it places and not lose it! The car has a button on the top which you can press to hear classic Lightning McQueen phrases. 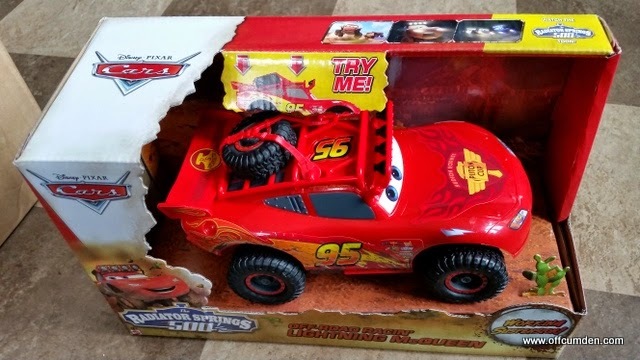 This new version of Lightning McQueen comes alive with wicked, off-road styling! He is large scale for wilder adventures! There’s no course too tough to tackle. Nothing is off limits! Blazing through tough terrain is a snap too when you have side-to-side steering: just press on the left or right of the vehicle to go where you want! When you press down on the rear of the car, you’ll hear his feisty engine revving sounds! Activate more iconic sounds and phrases by pushing a button on the roof! Kids will be able to recreate scenes from the films with this realistic off road action vehicle. Get in and drive, your adventure awaits! My children absolutely adore this car. It has been on long trips in the car with us, taken to bed with children and played with on a nearly daily basis. My only problem with the car is that the volume isn't adjustable and it is really very loud. It doesn't bother the children at all, but it is slightly annoying to have to listen to at that volume. If your children are Cars fans then they will love this Lightning McQueen car, just make sure you invest in some earplugs for you when you buy it! Disclosure: We received this car for the purpose of review. This had no impact on our review, which is honest and fair.